Isn't amazing how a new love can change how you view the world. 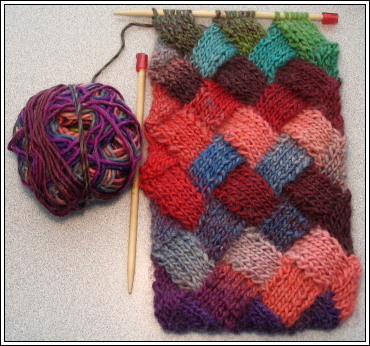 My latest knitting love is Entrelac. Although it seems complicated it's not. It's an oddly simple technique, once you get the rhythm of it that is. But then again rarely is a first kiss perfect, though most certainly sweet. (Well with the honey the first kiss was like intoxicating lightening. *wicked grin* But that's not really a story for this post...) The biggest part for someone just getting started with entrelac is that you have to be open to thinking about knitting in a different way. It's like taking a leap of faith, just as in love. You may crash and burn, but you'll more than likely surprise yourself with the bliss that is to be found. Here is the swatch I did Sunday. I washed the swatch and just spread it out wet, no pin blocking. Here's the Scarf I started Monday. 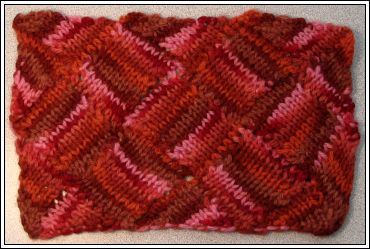 The scarf I'm doing in Entrelac is being knit with Trendsetter Yarns Tonalita in color 2349. That's the same yarn I gave Cookie during that visit to knit a mutual friend a scarf and hat set with. (totally her idea as she's the nice one, btw *L*) He was kinda picky on colors (Didn't want pink what the hell!?!) and I thought it would work for him. She did a great job. Mine is a much brighter color. Totally loving it. Although it has a bit of fuzz. It's very similar to Lang Mille Colori. I'm so glad you're still feeling the love. You've come a long way, ya know. I just can't get that..maybe I need to see someone do it in person..everyone was doing that entrelac dish cloth a few months back..I couldn't get that either. Wow! I love that top sample. I get the basic concept of it but it seems hard? Entrelac is something I have not yet tried. I've been seeing it more and more and liking it more and more...and of course, your scarf is the thing that pushed me over the edge. I love entrelac knitting. I made a car seat blanket for my daughter in the creamsicle colorway of lion brand homespun. Its fantastic! btw I finished Round 2 of Socks madness! wahoo! will bring them in to show-off...umm I mean share...on saturday hehehe!